Divestment has always been more about symbolism than economics. After all, boycotting a company or country can have a direct impact on the top (and thus the bottom) line. But you can only divest in a company by selling your shares of its stock, which requires someone to buy them. And unless the world knows WHY you have sold a particular stock, your choice becomes just one more “sell” decision taken by investors millions of times a day for millions of undisclosed reasons. This is why divestment campaigns are all about getting prominent institutions (such as universities, cities, churches and unions) to make divestment decisions, no matter how minimal in economic terms, tied to public declarations that these actions are specifically about Israel or the Israeli-Arab conflict. After all, a student organization calling for boycott, divestment and sanction (BDS) against Israel is just part of ongoing campus political noise. But Harvard University or the Presbyterian Church tying its name to a divestment call packs political power, allowing anti-Israel groups to punch way above their weight by leveraging the reputation of someone else. But what happens when an institution refuses to play along? You then end up with strange cases like the recent divestment brouhaha at Hampshire College. Hampshire, a small, progressive liberal arts college in Western Massachusetts, has one of the smallest endowments in the country. But it stands as a symbol having been the first college to publically divest that small endowment from companies doing business in South Africa in the 1980s. Hampshire as a symbolic prize meant that divestment activists, in the form of a student group called Students for Justice in Palestine (SJP), kept up its divestment crusade years after divestment had moved on at most other schools. College administrators were respectful and polite to SJP, even if they made it clear they had no intention of joining SJP in denouncing the Jewish state as the next South Africa. But during the course of an outside consultant’s review of school investment holdings, Hampshire decided to sell shares in a particular fund identified as invested in companies that did not meet the school’s ethical investment guidelines (policies that included support for unions, and statements on issues such as Sudan/Darfur, but no stance regarding Israel). SJP, which had asked the school to divest in companies doing business with Israel (some of which turned out to be in the fund selected by Hampshire’s outside consultant), quickly declared victory, announcing to the world that Hampshire had become the first US college to openly divest from the Jewish state. Given the importance of this alleged “victory,” it was curious why SJP made these public pronouncements on its own, rather than standing alongside college administrators and investment managers to announce this supposedly historic decision. The reason for SJP’s independent action quickly became clear when the administration announced that its investment decisions had nothing to do with Israel or the Middle East, and that SJP was deliberately misleading the public for its own political ends. This confusion continued for several weeks as Hampshire College administrators tried to have it both ways, allowing the student group to declare victory while assuring the press and alumni that the school had not divested. Much is made of Alan Dershowitz’s call for a boycott of donations to Hampshire (where Dershowitz’s son attended), but in fact the prominent Harvard attorney only clarified that the school could not straddle this issue, leading Hampshire President Hexter to declare in no uncertain terms that (1) the school had not divested in Israel; (2) the school maintained investments in the very companies SJP claimed were being boycotted and would continue to invest in them in the future; and (3) that SJP was inappropriately speaking on behalf of the college, unacceptable behavior that could have consequences for the student group. By then, SJP had already sent out press releases and public statements saying Hampshire had done what it clearly had not, taking advantage of the administration’s initial lack of clarity to encourage similar decisions at other schools. While they eventually modified their statements, moving from unequivocally declaring Hampshire was on their side to saying that SJP simply believed this to be the case (despite administration denials) with all their hearts. On the one hand, this campaign of deception was successful with Hampshire continuing to be held aloft as an example for other institutions to join Boycott, Divestment and Sanction (BDS) campaigns against Israel. At the same time, the behavior of SJP has put other schools on notice that being polite and respectful to student groups calling for divestment reviews caries a risk since these groups have proven themselves willing to do and say anything (including manipulating institutions and deceiving the public, regardless of the cost to a university) to gain their own political ends. While the recent Hampshire fiasco offered groups like SJP a temporary perceived victory, it may have also spelled defeat for any other similar divestment project in the future by broadcasting a warning regarding the excesses and dishonesty of divestment’s promoters. 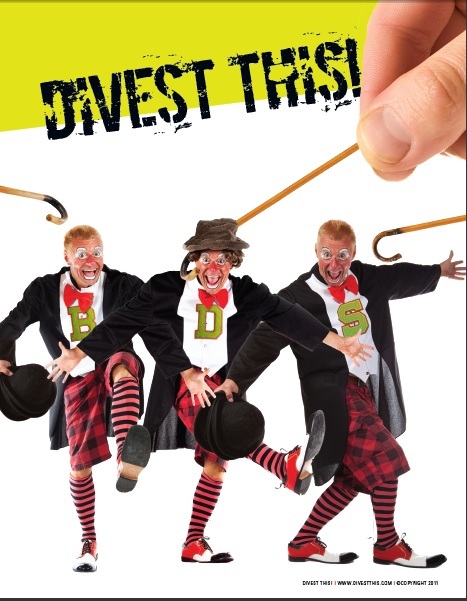 Having seen the results of Hampshire falling for divestment’s bait-and-switch, what are the chances that other colleges will fall into the same trap? And it’s made all the more ridiculous by federal law that prohibits Americans from undertaking BDS actions against Israel. Hey um this is a little late.. mostly because you are not really prominent enough to be taken notice of before now. Want to clarify a few facts for you because you are um lying in your post. Hampshire did in fact stop investing in those funds that invest in the occupation. By no means does this mean that the school is supporting sjps divestment call but the reality is the school is no longer invested in those corporations. If you wanna post scathing reports about palestinian solidarity atleast get the facts right. We do that when reporting on the IDF's actions and the rest of the work surrounding israel's support base. Gosh, well first I’d like to express my sincere appreciation for no longer being beneath you, um, notice. More importantly, if you get time from your important and busy schedule to read though what I’ve been saying about Hampshire and divestment in general, the point is not that an institution invests in this Israeli company or divests in that one. After all, in October alone, international investors socked $1.25 billion into the Jewish state. Now if I were to present that fact as “a stunning rebuke to the global BDS movement” or a “demonstration of increasing support worldwide for Israel,” you would (legitimately) want to know if those investments had anything to do with Israeli politics or BDS. In the case of Hampshire, the school sold off some mutual funds and some stocks in those mutual funds happened to include companies identified by BDS activists as targets. But as you admit yourself, this has nothing to do with the school supporting SJP. Especially since the school has made it clear that its divestment had nothing to do with Israel or the Middle East Conflict, then it’s safe to say that divestment (by which I mean divestment as a political act) has not taken place at Hampshire College, a point I hope will receive center stage during next week’s BDS conference at that school.